You already have a business, but it doesn’t “sell” enough? Or you want to increase engagement or keep your audience updated about something fresh? Or you are just thinking to start a business and don’t know what Marketing strategy to start with? Either way, Email Marketing can help you with all of this. Email Marketing is a part of Internet Marketing, it helps to communicate with your customers via sending emails. Email Marketing implementation comes with a number of advantages, especially for a small business with limited promotion budget. Take a look at the points we’ve outlined at Postcards Team. If you don’t have enough time to read the post, look through the infographic. Becoming noticed is harder than it seems. You may try Search or Display Advertising, SMM, SEO and many other tools but you should know, that according to MarketingSherpa study, 72% of consumers prefer to receive promotional info through Email. 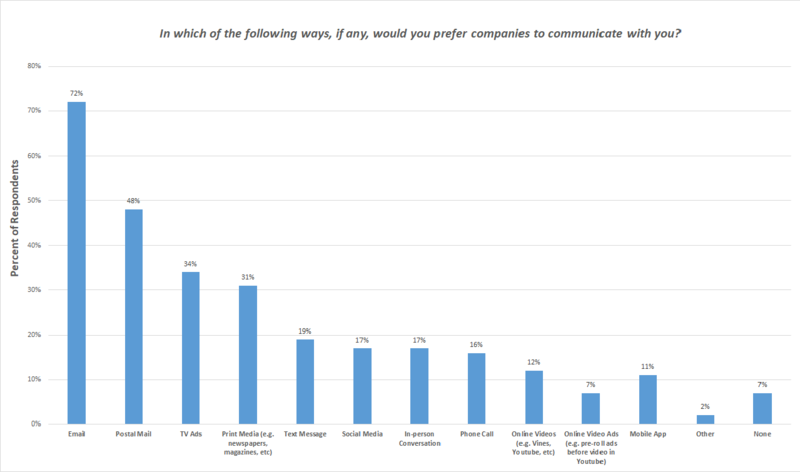 As for other ways, only 17% would like to answer a phone call or be contacted via Social Network. TV Ads are also not favored among prospective clients. So, make a conclusion. Customers always know whom the Email came from. 2. “Mobile” Consumers Will be Yours! There are more than 200 mln smartphone users in the world! And in the research from IDC, sponsored by Facebook, it’s revealed that the most frequent smartphone users’ activity is – checking their inbox! Mobile users are inclined to look through incoming emails more often than FB feed! That’s why it makes sense to run an Email Marketing Campaign. Moreover, Email Marketing allows you to reach users on other devices like tablets. However, in this case, you should be aware of Content Adaptation, otherwise, addressees won’t appreciate it. Email marketing doesn’t require great investments in comparison with Search and Display Ads or Direct Marketing. According to various sources, the ROI of Email is 3,800%. You may find and use the most appropriate free or inexpensive Email Template Builder, like Postcards and create your personalized Emails in a few minutes! Moreover, there is a great variety of Email Services Providers (ESPs) that allow to create and send thousands of Emails per day: MailChimp, Campaign Monitor, Marketo and many more! Try them and choose the best one for your business. If you can’t or don’t want to create and run Email Marketing Campaign by yourself, Marketing Agencies can help you out. It’s pricey but your Campaign will be run by experts. Email subscribers are more likely to spend much time on your site and purchase something – this traffic is absolutely relevant, so the chances of conversion increase dramatically. It’s hard to build a relationship with those who you don’t know personally, but Email Marketing allows to do that! If you provide Emails with valuable information, then customers will appreciate you more and more, and as a consequence they could become loyal brand advocates. Special Occasion Emails such as emailing a customer on their birthday with a special offer also can help build the relationship. Stay in touch and be useful! Did you find this post useful? Subscribe for more lessons about Email Marketing. Want to start creating your own Beautiful Emails? We made Postcards just for you. I'm a Digital Marketer, currently working at Designmodo. Personal effectiveness and Email Marketing are my favorite topics ❤️.